With Halloween quickly approaching we thought we’d take the opportunity to remind you of some potential hazards for your pets. Remember that decorations can be easily chewed on or ingested causing intestinal upset or even obstruction. Be sure to keep these items out of your pets reach. Halloween candy and treats can be hazardous or toxic. Items such a chocolate, raisins, and sugar free gum can cause serious health complications for your pet. Also, a dog may find that eating the wrappers or containers is the best way to get to the “yummy treat” which can also lead to intestinal upset or obstruction. 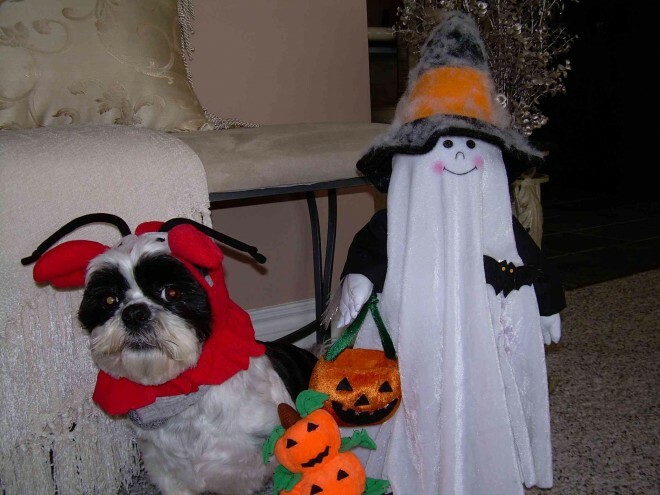 Store candy and treats in a high cupboard or away from where you dog (or cat) can reach. Small children often don’t know better and can reach out and grab your dog in a way that they do not appreciate which could lead to a scary situation for your dog. Lit candles (especially in pumpkins) could be potential burning hazards for a swishy tail or a nosy nose! Glow sticks can be ingested and cause serious complications. Place your cat in a quiet room with the door closed and your dog on a leash (or also in a quiet room with the door shut). You may be opening and closing your door often and a scared animal could try to escape out the door! Keeping safety in mind for everyone, Halloween can be a very fun time of year!